Screencaps for Ep 2.23 added & Season 2 completed! 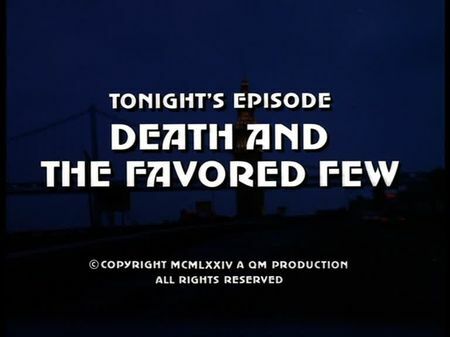 I have just added the screencaps for Death and the Favored Few to the episodes' page. Terence Aubrey, editor of a local high society magazine, is shot to death after returning from a drinking session by night. Stone and Keller soon find out that Aubrey had attended a party at Etta Morris Randolph’s mansion before, a wealthy widow and influential member of San Francisco's high society. They learn Aubrey was not that much of a welcomed visitor in the eyes of many of the other guests, and Mrs. Randolph also lets them know about her general dislike for him. Our two cops smell there are secrets untold, and their investigations produce that Aubrey actually blackmailed several individuals of the high society who have secrets to hide - with Mrs. Randolph being one of them, and her mentally unbalanced daughter, Joanna. Mike and Steve are getting more involved when Joanna's ex husband, who is addicted to drugs, threatens her to kidnap their daughter for ransom. As the murder case seems to get solved, another family secret offers a different perspective. Many scenes were filmed in and around Ralston Hall Mansion in Belmont, south of San Francisco, which served as Etta Morris Randolph's imposing mansion. Aubrey's house is located at 1212 Lombard Street, and his office was at 131 Townsend. Steve chases down to the industrial harbour where his car finally crashes into a wooden hut close to Pier 70. Mike interviews Roger and Louise Maxwell at the Golden Gate Park tennis courts, and Steve goes to Maxwell's law office at 220 Jackson Street. He also visits the Fifth & Mission Parking Garage where Joanna's ex husband used to work for a while. Police can finally bust Joanna's ex husband at John McLaren Park.